Welcome to the ACS Brazil International Chemical Sciences Chapter! Here you can find all the information about the chapter, past and upcoming events and latest news about chemistry. In line with the ACS long-standing commitment to learning and continuous improvement, we welcome your feedback about our activities. Let us know if you are willing to contribute and assist us in accomplishing our goal. 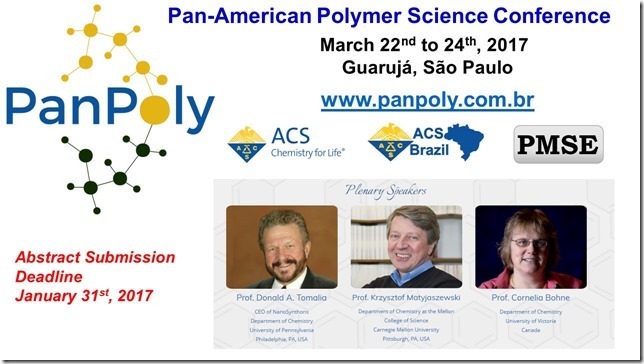 Join us at the 1st Pan-American Conference in Polymer Science, 22-24 March 2017, in Guarujá, SP, Brazil.